I ran into another hang up with visual novels. 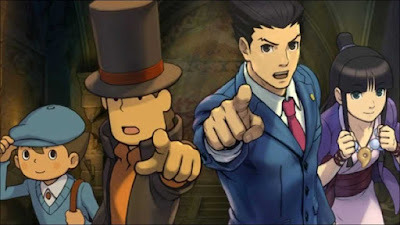 I've been trying to play a variety of them lately and I've given up on everything except for Professor Layton vs Pheonix Wright. But, I'm almost ready to give up on that too. A big issue I run into with these games is my reading speed. I read a lot and I've been reading a lot for as long as I can remember. Because of that, I read really fast. I read much faster than these games display text. I basically end up just mashing the A button or tapping the screen as fast as I can to get the text to show up faster. I wish they would either display more text on the screen at one time or increase the text display speed. And the worst is when they slow down the text to a crawl for dramatic effect. It's so infuriating. Ugh! I can tell I'm almost done with this venture into the visual novels left in my backlog. I'm down to just the one last game and I'm either going to power through and finish it soon or simply give up out of frustration. Either way, it's about time to move onto the last few games in my backlog. I have the same issue with visual novels. They often make me question why I'm not just reading a book. Yeah, I want more gameplay in my games than these have been offering. I think if I'd find the right visual novel I would be fine, but I haven't yet. All of the ones I've played end up not having enough gameplay for me.